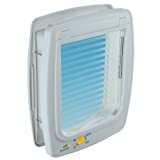 Sureflap Microchip Pet DoorMicrochip Pet Door - Simple installation Includes Curfew Mode Made From Hard Wearing, and Easy to Clean ABS Plastic - Larger in Size Compared with a Cat Flap - Ideal for Larger Cats and Small Dogs Includes BONUS eBook series 'YOUR PERFECT PET GUIDE BY E-COMMERCE EXCELLENCE'. Loving cat owners always strive to give their pets as much freedom as their desire to encourage their mental and physical growth. Installing a cat flap is the easiest way to make sure they can come and go as they please, without having to mew insistently at either side of the door. But when you install a cat flap, how do you stop uninvited visitors from barging their way in? As soon as word spreads that you stock the really good treats, you'll have the whole neighbourhood round. What's more, they're likely to mark their territory while they're visiting! Infrared cat flaps are the answer to your prayers if you're fed up of feline or canine intruders. 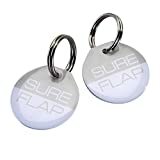 Infrared cat flaps come with a collar for your moggy to wear that will unlock the cat flap only when they are near. They are relatively easy to fit (though you might need to get a professional round if you're not confident with DIY) and your cat will soon become accustomed to how they work. And they can lord it around the local area, safe in the knowledge that they have a haven for escape that no one can invade! The really high end infrared cat flaps will offer you a range of settings according to your situation. 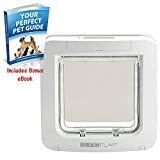 You can choose whether your cat can get in and out, is restricted in one direction or you can lock the flap altogether if you want to keep your cat in. Although they're a great invention, there are several things you need to be aware of if you're investing in an infrared cat flap. First of all, you need to be sure that you're getting a reliable product. Ask any cat-fan friends of yours if they have any experiences or recommendations for you. 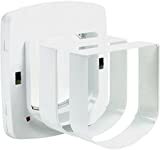 Also, if you're going to install this kind of cat flap, you need to teach your cat not to hang around the door when intruders are prowling around outside. If they get too close to the sensors, they'll set it off and open the cat flap. Instead, encourage a healthy distance between them and their competitors. No teasing allowed! When you've fitted the infrared cat flap, you may need to take a little time to teach your cat how it works. Some flaps emit an audible little 'click' when they're unlocked. Your kitty will soon learn to listen for this and enter or exit only when it's heard. Also, some infrared technology can be a little under-sensitive so your cat might have to take a little time to try it a few times before it engages. There can be an early teething period with infrared cat flaps but as long as you're patient, you'll get the best out of your new installation. And we all know cats are intelligent creatures so they won't take long to get to grips with the new feature.